Ultimate Leg Training - A Guide For Teenagers To Make Their Legs Grow! To make your legs grow, you need a solid training routine to maximize its development; you can't just squat for hours on end. Here's a great guide for teens with workouts and explanations to build huge legs! Learn more. Leg training is arguably the most painful and taxing training session of the week. Leg day is what separates the boys from the men. The legs contain possibly the most admirable muscle groups, but only if trained correctly. Many people will tell you that it can become difficult to think carefully about what you're doing when training legs, simply because it's so intense. If you ask any bodybuilder with a huge pair of quads, they will all tell you the same thing ... Leg day hurts! Now obviously there is more to it that just making it hurt. The quads and hamstrings are two large muscle groups, and so they need to be stimulated fully and properly. In order to do this you need to use a range of exercises to ensure that you hit each part of these muscles. At this point I expect that a lot of people reading this are thinking 'Squats and Stiff-Legged Deadlifts?'. If so, you're right. But once again, it's just not that simple. There are many variations of just about every leg training exercise, each one working a different part of the target muscle group. If we look at how the muscles of the legs are laid out, it's easy to see why such intricate training is needed. The quadriceps are divided into four muscles. These are the vastus medialis, the vastus lateralis, the vastus intermedius and the rectus femoris. Each of these portions of the muscle can be directly targeted by performing the simple compound movements such as squats and leg presses. However, the positioning of your feet and legs dictates which part of the quadriceps you stimulate the most. I believe that this is true to such a degree that even just pointing your toes in a different direction when performing an exercise can, over time, make a big difference. 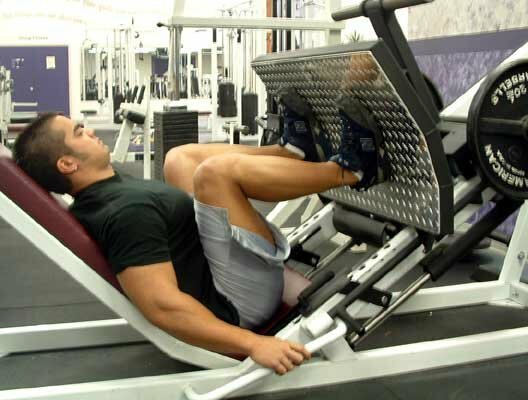 One example of this can be seen when performing leg presses. When people first start training, they will develop their own way of performing these. Some people will have their legs flared wide, others will have them closer. I can say with certainty that if you were to observe how these people's quads developed over time, there would be a noticeable difference. Basically, this is due to the mechanical advantage that each portion of the quads have when the legs are pressing in the various positions. Unfortunately, when it comes to developing the quads, there is no exercise that just builds 'overall bulk', and so the need to rotate the angles and positions from which you press arises. Performing leg presses or squats with a wide flare to your legs will work the teardrop shaped muscle harder than any other variation. This is because this muscle will try to pull the knees closer together. Bending the legs to any further than about 90 degrees can be counter productive here. Tension is taken off of this muscle after about 90 degrees, and is placed on the hips. To further stimulate this muscle, point your toes outward and keep your knees in line with them at all times. This muscle makes up the outer portion of the quads. The 'standard' squatting position is ideal to stimulate this muscle. Having the positioned at roughly shoulder width, with the toes pointing out a bit will work this muscle hard indeed. 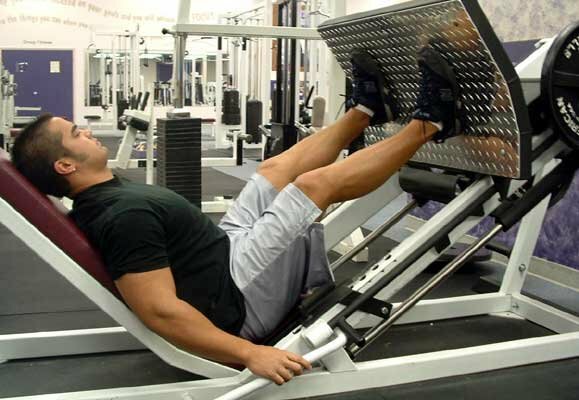 Leg presses can also be used for this, but I feel you will get a greater benefit from primarily using squats to do this. It is crucial when performing either exercise like this to keep your knees in line with your feet. Failing to do so will not only take the tension off of the desired muscle, but gives you a good chance of injuring your knees. This muscle sits underneath the visible quad muscles. To work this muscle most effectively, a close stance is needed. This can be done soundly when performing Leg Presses. The toes must not be pointed out. It is possible for some people to perform squats in this position, but many people will not be able to, due to where their calves insert. Hack squats, lunges and even leg extensions would be another very useful exercise for stimulating this muscle. Located in the upper front part of the quads, this muscle can prove difficult to stimulate when performing any form of pressing movement. I believe that leg extensions are the best exercise to work this muscle. Even still, the toes must be pointing directly forward for this to have much effect. I don't totally buy into this idea, but this is something to consider when trying to stimulate this muscle. to develop your abs, and felt a strong contraction in your rectus femoris? Lots of people would tell you that they have. I am not too sure about this idea, so I cannot make a justified opinion, but it might be beneficial to train your abs on leg day, and make sure you perform leg raises too. All of these exercise variations should be performed equally frequently, if you wish to fully develop your quads. As I mentioned earlier, leg day is intense, and it can be difficult to remember all of this during a training session. I implore you to experiment with this a bit, and try to turn it into habit. In doing so, over time it will help you to build a thick, full pair of quads. I believe that the tempo when performing exercises for the quads, if your primary goal is mass, should be about 1 second concentric and 2 seconds eccentric. legs, you will have seen how large and well developed they are. This would suggest that the quads are designed for power, and thus an explosive, powerful rep tempo seems fitting. Due to the position of the hamstrings, there is much less you can do to shift emphasis between the parts of this muscle. Changing the position of the legs and the toes will indeed make a difference, but sadly a much less noticeable one. With the hamstrings, the main variable to focus on is the types of exercises you are using. I have seen many teenagers who only use seated or lying leg curls. These exercises are very important to develop the hamstrings, but others are needed to aid will building overall size. Deadlifting is a rather controversial exercise. There is a lot of debate as to which muscle deadlifts stimulate the most. I am a firm believer that all of the different variations of the deadlift hit your hamstrings hardest. If you look at the anatomy of the hamstrings, it is obvious to see how they are worked hard when performing these. Likewise, if you look at the anatomy of the muscles in the back, you will see that deadlifts don't work any of those muscles through even half of their ROM. This exercise is great for building overall mass on the hamstrings. This is for a number of reasons. First, you can use a lot of weight on this exercise, and also increase the weight you use rather rapidly. More overload is then created, and thus the hamstrings grow. Also, the hamstrings are moved throughout their full ROM when performing these. They remain in the 'sweet spot.' They are worked in their strongest position, meaning that you can use the most weight. It's for this reason that you are able to use considerably more weight. Similar to deadlifts, they keep the hamstring in the 'sweet spot' throughout. This variation is similar to stiff-legged deadlifts in how they actually work the muscle. The difference is that they put a large amount of stress on the inner portion of the hamstrings. A lot of people will find that genetically they will have slightly less dense fiber in the outer portion of the hamstrings. People like this will benefit from this exercise. In order to develop a pair of huge, thick hamstrings, at least one of these variations should be included in every leg workout. The hamstrings are similar to the biceps in the function they were designed for. I believe that a tempo of 2 seconds on both the eccentric and concentric will benefit you most, if your primary goal is mass. Here is a sample training routine that could be used by someone looking to build overall size to their legs. Everyone has different strengths and weaknesses. Choosing which exercises and the amount of sets to use is important. This is only an example, and should be altered depending on weaknesses or strengths in your physique. A person with a poor 'tear drop' might choose to perform wide stance smith squats instead of squats. I can't stress strongly enough how important it is to analyze your physique before you design a new training routine. Unless you're emphasizing the correct body parts, you might actually be hindering your progress. I feel that it's important for a teenager to build large legs. If you plan to compete later in life, having big legs will give you a much greater chance of winning a show. Intelligently selecting exercises for your legs, along with training so hard that you vomit, cry and soil yourself, will put you on the right track to building a pair of huge wheels! All of this may seem daunting to some, but I ask you to give it some time and patience. I can assure you that putting what has been discussed into practice will no doubt develop you some disgustingly massive legs. Maintaining a sound nutrition plan will of course make leg training easier and more successful. That's about it. If you've got any questions or comments, I will be more than happy to answer them.